How to cook fresh salmon was never a problem for me. I grew up only eating canned salmon and almost always in salmon patties. I never had a desire for the fresh stuff even with all seafood. The only fish I liked was the filet of sole from Frishes Big Boy restaurant; those I could eat every day. All this was before I tasted the delicious Alaskan salmon. One time I took a wonderful Alaskan cruise. On this trip I ate fresh salmon cooked every way imaginable. It was all so delicious! I visited several businesses there who packaged seafood to ship all over. I found out that I could order the seafood and they would ship it overnight to me frozen. Once I started ordering this great tasting Alaskan salmon I could not eat any other. I began asking everyone how to cook fresh salmon. Lately I have been so hungry for some good Alaskan salmon recipes so I decided to place an order with Captain Jacks Alaska. It is quick frozen retaining that great fresh taste and makes the best salmon recipes. 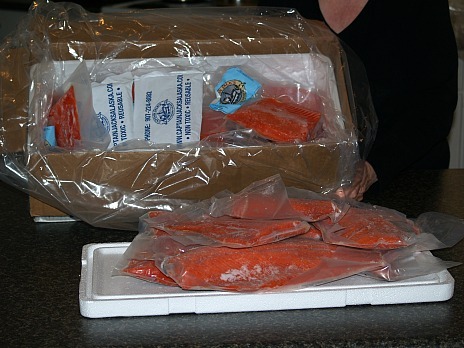 As I expected, my wild Alaskan salmon arrived in great condition; still frozen solid. Once again I started asking friends and family how to cook fresh salmon, looking for new recipes. This is seafood which is delicious when seasoned with all kinds of spices, vegetables and even fruits. As I said earlier, we never had much salmon growing up; it was not always easy to purchase. The only kind was in cans and that was even expensive back then. No one in my area asked anyone how to cook salmon; it simply was not available there. Over fishing between 1920 and 1959 resulted in such low stocks that only along some of the coast was salmon available. Alaska became a state of the United States in January of 1959. After becoming a state, the federal government implemented new regulations on the salmon fisheries. There were many struggles and another large decline in 1972 but then the salmon catch was able to reach a record level high. Today this seafood is readily available all over the country, like me ordering it and having it shipped to my door. Compared to other protein foods, salmon is quite expensive but so worth the price. All who ask how to cook fresh salmon know the many health benefits of it. Most cooks like to fix wild Alaskan salmon at least on occasion for their families. The most popular qualities of salmon are the rich content of omega 3 fatty acids, good source of protein, vitamin D and selenium. Keep in mind that the many health benefits of wild salmon have not been found in the currently popular farmed salmon. The consumption of wild Alaskan salmon helps to limit the inflammation of the joints and all parts of the body. It helps you to think more clearly and help to reduce other brain related problems. The vitamin D and selenium contained in the salmon has been associated with the prevention of certain types of cancers. The omega 3 oils found in salmon are known for improving eye vision. It is found to have demonstrated effectiveness in fighting macular degeneration and dry eyes. Eating salmon has been linked to decreasing the risk of heart attacks, strokes and high blood pressure. Omega 3 found in wild salmon locks moisture in skin cells contributing to younger looking skin. How to cook fresh salmon? The following recipes are just a few ways to cook fresh salmon with a variety of flavors. Dry salmon fillets with paper towels; sprinkle with lemon juice. Combine flour, salt and pepper; dip salmon fillets in mixture. Sauté salmon fillets until brown on both sides turning only one time. Combine onion powder, salt and pepper and rub salmon with mixture. Drain wood chips and place on coals. Place water pan in smoker; add water to the fill line. Place salmon fillets skin side down on upper food rack; cover with smoker lid. Cook 1 ½ hours or until fish flakes easily when tested with a fork. Want to know how to cook fresh salmon? Try this flavorful recipe. The combination of orange, cinnamon and cumin sweetened slightly with a bit of brown sugar is wonderful. Combine orange and lemon juices; pour over salmon in flat shallow dish. 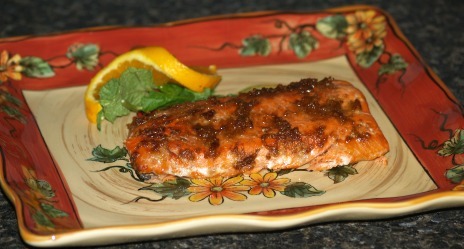 Refrigerate salmon in marinade for up to 2 hours. Combine sugar, orange zest, cumin, cinnamon, salt and pepper in a small bowl. Remove salmon from marinade and place on oiled baking pan. Rub dry mixture over both sides of the fillets. Bake for approximately 10 to 15 minutes until fish is opaque and flakes when touched with a fork. How to cook fresh salmon? The family will love this meal in one. 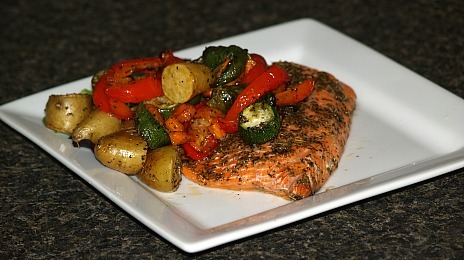 Try this fresh seafood recipe with roasted potatoes, zucchini, carrots and bell peppers seasoned with Italian spices. Coat 2 foiled lined baking sheets with cooking spray. Arrange vegetables evenly over one sheet; drizzle with ½ of olive oil. Sprinkle vegetables with ½ of Italian seasoning, ½ of salt and ½ of pepper. Arrange salmon on other lined and sprayed baking sheet. Drizzle salmon with lemon juice and sprinkle with remaining olive oil, Italian seasoning, salt and pepper. Bake sheet with vegetables until tender about 30 minutes stirring occasionally. Bake sheet with salmon 15 to 20 minutes until fish flakes when touched with fork. Serve salmon topped with vegetables.